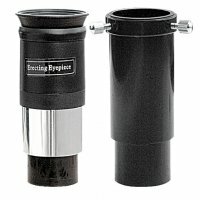 Home :: Eyepieces :: Sky-Watcher 10mm Erecting Eyepiece set. This 10mm Erecting Eyepiece can be used on any telescope, refractor or reflector to correct the orientation of the image. On a refractor: The erecting eyepiece can be used on any refractor, even a short-tube. It works alone without a diagonal. The extension tube is needed only when focus can not be reached by using the erecting eyepiece alone. On a reflector: With the Erecting Eyepiece attached to your Newtonian telescope, images are easily corrected while still maintaining their quality and clarity.